HomeCOMMENTARYSOLOMON BEREWA: HEIR APPARENT, OR A MARCH OF FOLLY FOR POWER? Politics is a five-year sport among Sierra Leoneans. We hardly know our politicians or their designs on power until they have accomplished their schemes while injuring us. Politics according to Harold Lasswell is about “who gets what, when and how” in a society. Our politicians know this game at our peril, owing to the ignorance which abounds us about politics. In Power and Personality (1948), Laswell examined the imperatives of power. He concluded that unless men who seek and wield power are subjected to the most delicate psychological analysis, democratic society will remain ignorant of what drives men into the public arena; and accordingly we would be ill-equipped to tame, or even notice their chicanery. Accordingly, an estimate of our leaders should be undertaken assiduously. It has been for this reason that we have been saying that a portrait of an aspirant cannot be painted on his or her SCHOOLING misrepresented as EDUCATION alone as we often do when we say that such a man is qualified because he has acquired a tertiary degree or he is most qualified because he has a terminal academic degree. In fact, the failure in developing a well-ordered society in Sierra Leone has not been owing to want of educated men and women. It has been largely the factor of their incompetence or a lack of willingness to be prudent in exercising their duties. Novelist Mark Twain once remarked a truism which has never guided us in our estimate of leaders. “I have never let my schooling interfere with my education.” Thus, the assiduity in our estimation of leadership in Sierra Leone must include a reckoning of their public record of responsibilities as we shall soon delve into that of Solomon Berewa. Thus, if we sometimes appear cheerless if not churlish in our estimate of certain politicians, it is because we have no faculty for genuflection for leaders who do not inspire us to transforming leadership. We now turn to a retrospective on Solomon Berewa, the public servant. This aspect of our essay shall be followed by forays into politics as aspirant for the presidency. Then we shall close by looking at his political fortunes for success at the SLPP delegates’ convention. The recent hurly burly by compatriots over the sour and blasphemous assertions by Solomon Berewa at the Southern Convention of the SLPP now give us the muster to hasten to his own animated hope of becoming President of our republic. The bugaboo over Mr. Berewa’s inability to draw apt analogies in politics and his Christian conjectures, belie his worthiness as public servant and fledgling politician. It is our duty to checkmate his impetuosity and arraign him before the nation on the proposition whether he has what it takes to enter State House. We are now prepared to under that task below. When we see a man of no political experience buffeted all the way to the vice presidency, and he is touted as a leading figure for the presidency, we wonder whether such a man defies articulate description in politics. To avert that prospect, we must find a manner to adequately undertake an estimate of his public life. To appreciate the emergence of Solomon Berewa to the fore of the nation, we shall attempt to present him through the concept of patronage. In client patron relations, the patron provides protection, generosity and the client reciprocates with conspicuous gratitude. In a fine article, Culture and Democracy in Africa Today, Anthropologist Maxwell Owusu, suggests what seems to be the typical African client-patrons relations with unequal status of a high status individual and a low-status individual. The pair may be equally highly educated but the patron enjoys a high status because he provides the jobs. One of the instances in such client-patron relations suggested by Owusu is one in which the relationship is conspicuous-power versus conspicuous obedience and sycophancy. It is this model that motivated Robert Price to find analogues in what he calls the Big-Man Small-Boy Syndrome. Along Owusu’s and Price’s analyses, it is easy to find the Big-Man Small-Boy Syndrome endemic in our politics. To begin the retrospective on Solomon Berewa the ?small boy,’ let us go back to where the relationship may have begun. Solomon Berewa cut his teeth in politics when he was appointed to the NPRC’s National Advisory Council. This was the soldier’s enterprise to return to civilian rule headed by Tejan Kabbah as chairman, current Internal Affairs Minister was vice chairman and Solomon Berewa served as General Counsel. By NPRC Decree No. 7, 1992, the National Advisory Council was established with the function of “working out modalities for the return to multiparty democracy…” At the end of the Council’s labor for the soldiers pretending a well-ordered society, a Draft Constitution was introduced on 9th September 1994. This ?constitution’ was greeted with disdain for its revolutionary provisions which attempted to remake the republic after the fashion of the parvenu regime of the NPRC. It is needless to say the soldiers abandoned it to the ash bin of history and continued their tightrope walking as the unlikely governors of Sierra Leone. The National Advisory Council under the aegis of Tejan Kabbah, George Banda Thomas and Solomon Berewa botched their first cause in statecraft. Instead of crafting the constitution in question as a frame of Government and protector of Human Rights as is the fashion of modern constitutionalism, the bevy of platitudinal constitution-makers, gave the soldiers what they had been pretending – The Constitution as a Revolutionary Manifesto, something they and the soldiers lest understood was suitable for a fallen republic. Their preferred frame of government uprooted the old order and remade the elements of the state. The nature of this frame of government as we have come to know it is common in Communist countries. For Kabbah and Berewa, the would be twosome this was only the prelude to bungling statecraft at Abidjan, Lome and in the Agreement for the Special Court for Sierra Leone. At Abidjan, Mr. Berewa agreed to a lopsided accord in which the rebels would go scot-free without any redeeming clause to trigger prosecution against them if they breach the terms of the accord. Thus, we notice in Article 14 of the Abidjan Accord that there is no clawback or trigger mechanism to prosecute the RUF if they persisted in treachery: “To consolidate the peace and promote the cause of national reconciliation, the Government of Sierra Leone shall ensure that no official or judicial action is taken against any member of the RUF/SL in respect of anything done by them in pursuit of their objectives as members of that organization up to the time of the signing of this Agreement..” But this climate of impunity set in that accord was again repeated in the Conakry Accord and the Lome agreement. The rebels’ triumph at the negotiating table signaled to them that treachery pays and it is rewarded by weak drafters of agreements who agree to an unwieldy power sharing model which grafts new provisions to an existing constitution at the detriment of the people. If Abidjan and Lome were dress rehearsals for incompetent statecraft, the framing of the Special Court for Sierra Leone was in the offing. That Mr. Berewa failed to reconcile these provisions among others with the draft of the Statute of the Court which suggested the supremacy of the Special Court over the courts of the Superior Court of Judicature, is the sore point which has spawn many motions in the Trial and Appeal chambers of the Special Court alongside those filed in the Sierra Leone Supreme Court. In doing so, the objects and reasons for fashioning the Special Court are being impeded or delayed at considerable cost and peril to the sovereignty and thereby undermining of the Constitution of Sierra Leone. Why Mr. Berewa failed to advise the President and Parliament that an amendment or other alteration of the Constitution, that especially includes Entrenched Clauses as stated in section 108 (3), would require a Referendum is a thorny issue which is taking up more of the Special Court’s vital prosecution time and putting into question whether Mr. Berewa understood the imperatives of making treaties for international organizations. One may argue that it was Parliament which ought to have sought a referendum to complete the ratification process because lawmaking is her purview. But under the doctrine of collegiality, our legislative body is a colleague of the President in making laws in Sierra Leone. Thus, this assortment of blunders has cast a lengthened shadow on Mr. Berewa’s abilities to conduct statecraft to the greater benefit of the nation. Having demonstrated the pith of Mr. Berewa’s record as a public minister, we must now turn to his personal ambitions for political power. There is no longer any question that President Kabbah has endorsed his pliable vice president for the presidency. But are Mr. Berewa’s political fortunes are at best now inversely proportional to that support? Or is this a march of folly? HEIR APPARENT OR MARCH OF FOLLY FOR POWER? The strange course being undertaken by Berewa to gain the nomination deserves some attention. As if his endorsement by the President were not adequate to propel him into State House, Mr. Berewa has undertaken a design to catalyze it. It very much appears that Vice President Berewa’s heir-apparent status fashioned by Big man President Kabbah for Small boy Berewa has fallen on hard times or has been squandered by the latter’s lust for power. When he pined at the SLPP Southern Convention, that he will “emerge as the next president,” he made an absolute surrender of his personality in politics in that breadth of wind and wave of his speech. Introducing his political personality in a quest for the SLPP nomination, he looked not the figure of a statesman on the hustings for votes, but as if a tiger had broken loose from a menagerie to wander into his wild habitat to prance after prey. His alleged blasphemous howl attracted more attention than whatever whit of substance was in his resolution for office. But lurking behind that yammer is the condition of a desperate politician lusting for power. Barbara W. Tuchman has reminded us in her valuable book of history, The March of Folly, that Tacitus once remarked that the lust for power was chief among the forces affecting political folly and the most fragrant of all the passions. Others have elaborated that because this passion can only be satisfied by power over others, government is its favourite field of exercise. In that case Mr. Berewa has indeed entered upon that a well-cultivated field. The avenue Berewa has chosen to reach the summit of his ambitions is peculiar. This path is paved with machinations hitherto the province of the APC politicians in the reign of Siaka Stevens. Unlike most of the other political parties, the SLPP has a modicum of intra-party democracy save the times it breached the rights of Charles Margai to compete with President Kabbah for the 2002 presidential elections. The SLPP has a slate of delegates to be won from the 14 electoral block districts and each aspirant must garner 55% of the total to be nominated candidate for President. Mr. Berewa it has been told wants to circumvent the procedure to win the lion’s share of the delegates through design and intrigue. Stealing a page from the political play book of the APC epoch, Berewa has had his eye on State House with a Machiavellian intrigue. To that end, he propounded a new scheme of electoral politics, which, it must be owned, is not altogether without plausibility for his passion. Mr. Berewa’s appetite for power grounded his own scheme called the WORKING GROUP – a method of delegate selection outside the ambit of the SLPP regulations for the nomination. Authorities on the behaviour of leaders of political parties have stated that members of the ruling class invariably stay together in cliques to hold on to power. Maurice Duverger the foremost authority on political parties says that such cliques may take the form of a “CAMARILLA – small group which makes use of close personal solidarity as a means of establishing and retaining its influence.” The Camarilla was well-rooted inside the APC as it consolidated its power in the early 1970s until it sealed it with a corporate imprimatur in the 1978 One-Party Constitution. To appreciate this method of gaining power by group interest, we have to look at the many intrigues broached by members of the ruling elite in the APC. Unaware or discounting such knowledge, people often credit Siaka Stevens with maintaining power for many years without regard to the fact that he often conjoined his lust for power with equally insatiable members of the party. When he for example wanted to establish a one-party state, he found confederates on the Bench and Bar between lawyers and the educated class in and out of the University to accomplish that goal. In his last intrigue in office for example, when he wanted General Momoh to succeed him, he sought a constitutional amendment from the ranks of Parliamentarians. 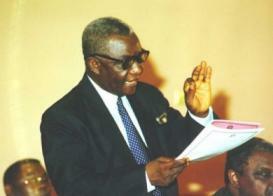 The amendment enacted, jettisoned Sorie Ibrahim Koroma from the line of succession when Stevens retired. Mr. Berewa has forgotten how he climbed in the supreme berth of state – President Kabbah placed him there as his pliant minion. A Small boy as we have observed above must always be subservient to the Big man or the Small boy risks losing the support of the Big man. Demonstrating arrogance of power when the Big man is still in office vitiates the client-patron relations at the peril of the client.